What Time Is Memorial Day Parade in Downtown Arlington Heights? 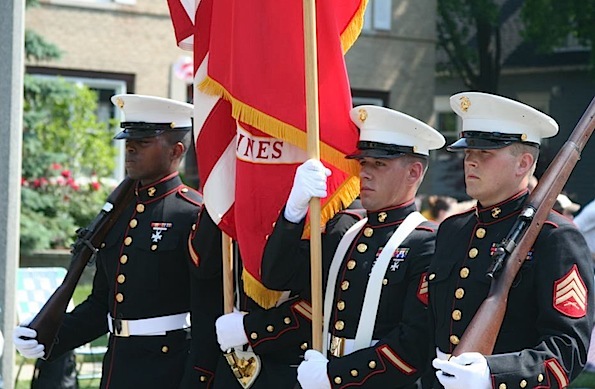 U.S. Marines on Euclid Avenue at Memorial Day Parade, Arlington Heights. Memorial Day (Monday May 29 2017) events in Arlington Heights include a Parade (9:30 a.m.) through downtown from Sigwalt Street and Arlington Heights Road to Memorial Park at Chestnut and Fremont, and a Ceremony in Memorial Park immediately after the parade (about 11 am). Following the 98th Annual Memorial Day parade, there will be a Memorial Day Ceremony at Memorial Park, Fremont and Chestnut, at 11 a.m. which includes the reading of names of area veterans who passed away in the last 12 months, honoring Arlington’s Fallen Heroes and the annual “Remembering Our Veterans” photo will be taken. All veterans are invited to participate in the photo. Marching route approximately 4900 feet. Memorial service at Memorial Park after parade. American Post No. 981 Veterans of Foreign Wars traditionally host the Memorial Day Parade at 9:30 a.m. on Memorial Day. The Grand Marshal of the parade for 2017 is Brigadier General Frederick R. Maiocco, Jr., Commander of the 85th Support Command in Arlington Heights. The 85th Support Command’s nine Brigade Support Elements and 46 Army Reserve Battalions—dispersed across the continental United States and Puerto Rico—are operationally controlled by First Army. In their support role, the 85th Support Command maintains readiness for these Soldiers in support of Pre-Deployment, Post-Deployment and Rotational Distributed Forces. Memorial Park Wreath Laying Ceremony. Aristo ‘Art’ Nicholson Receives Bronze Star, Purple Heart.